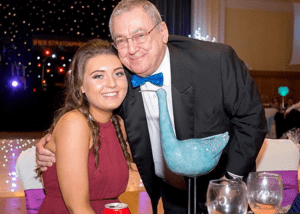 You may have recently seen updates over on the Cure Crohn’s Colitis Facebook page about the fundraising efforts of Phoebe, and her family and friends. She was diagnosed with Crohn’s Disease at the tender age of 11 and has experienced things that healthy people, of any age, could not even imagine, including multiple invasive procedures and 16 weeks of no food. Phoebe’s previous fundraising activities in 2016 had already raised thousands for Cure Crohn’s Colitis, but, that wasn’t enough! With the support of her family and friends, the idea for Phoebe’s ball was born… Read more.